Growing up in East Palo Alto, Michelle and her siblings led a sheltered life, not allowed to go beyond the gate of their home unsupervised, kept safely within the confines of school and family. Michelle wanted an opportunity to explore beyond her home, discover other neighborhoods and have new experiences. Luckily, Aurora had recently applied to become a Big, hoping to share her free time and adventurous spirit with a young person like Michelle. Aurora had accomplished a lot as a young professional, landing a job as a designer at Google. But beyond her professional accomplishments, she wanted to expand her life in a way that both made a difference in her community and would empower a girl to reach her full potential. When Aurora and Michelle met they immediately had a good feeling about each other. 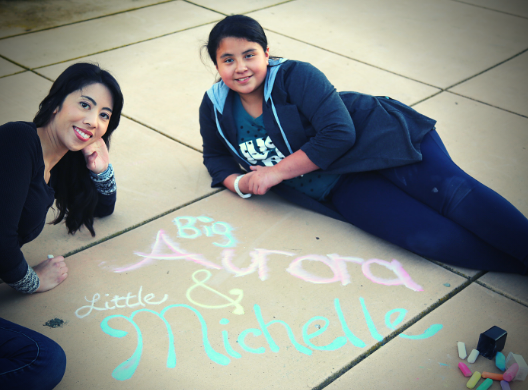 With a lot in common, Michelle and Aurora both enjoyed arts and crafts, trying new restaurants, and being outdoors. Aurora has become such an influential role model that Michelle now wants to follow in her professional footsteps and be a designer at Google too. Aurora has taken Michelle to work, so that she can experience the campus and Google work culture. They’re also constantly working on creative projects together, such as floral arrangements, scrapbooking, baking, drawing, painting and more. In addition to having a creative outlet, since being matched, Michelle has improved greatly in school. Before she met Aurora she wasn’t on top of her homework and would forget to do assignments. Aurora has tutored her, which has lead to Michelle developing more focus and confidence at school. Now Michelle’s doing better in school and can connect her education to long term goals and professional aspirations. Aurora is grateful to be an integral part of that process. They both enjoy each other’s company and have an incredible amount of fun together. But there’s a deeper connection. Michelle is learning more about the world around her, with expanding opportunities and a more solid foundation. Big Aurora says Michelle has made her life much more full — she always has a buddy to take with her on a new adventure. And Little Michelle says that life is better with her Big, “she really is like my Big Sister.” They also agree on this: the match has been so fulfilling that they each expect this special relationship to last a lifetime. Aurora and Michelle will be honored at the 2019 Annual Gala: Igniting Potential where we will premiere a short film about this inspiring match.